A new home for web videos. 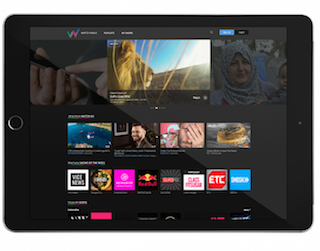 Comcast is getting into the online video game with the launch of Watchable, a multi-platform service that curates videos from outlets such as Vice, Mashable, Fast Company, BuzzFeed and more. Watchable—in beta for now—is available for iOS, at watchable.com, and via an app on Comcast’s X1 streaming TV box. The service is completely ad supported. “We want to continue to connect creators of compelling content with viewers who want to be entertained, and have been experimenting with new partnerships to deliver more high-quality videos from the web, especially to the television,” wrote Sam Schwartz, Comcast’s chief business development officer, in a blog post. Other media outlets sharing video on Watchable include Defy Media, Discovery Digital Networks, GarageMonkey, GoPro, Jukin Media, Machinima, Maker Studios, Mic Media, NBCUniversal, The Onion, POPSUGAR, Red Bull, Refinery29, Scripps Networks Interactive and Vox.